Image: McDonald's. Design: Kenzie Mastroe/SheKnows. December is full of sweet treats. From Advent calendars to Christmas cookies, it seems sugar-laden goodies abound. And McDonald’s — never one too miss out on the action — is getting in on the seasonal goodie game. The fast-food chain just announced their holiday pies are back, at least for a limited time. The dessert looks a lot like their infamous apple pie, but with a few notable differences. 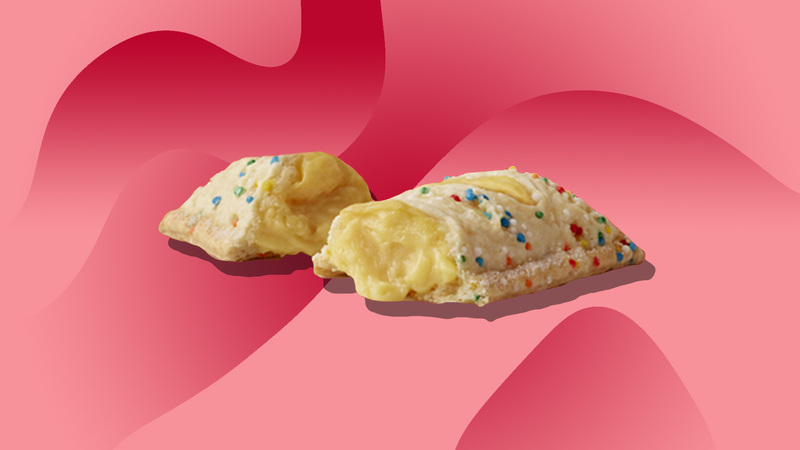 Instead of being filled with jam, the holiday pie is full of custard. The exterior is browned and then coated with glaze. Oh, and the whole thing is topped with rainbow sprinkles. The return of the holiday pie was confirmed by McDonald’s on Monday with a “’tis the season” tweet. However, when some Twitter users expressed concern after they were unable to find the sweet snack, the chain clarified their initial statement. Hi! While we haven't released an official date for the Holiday Pies, their availability will be decided by the location's owner/operator. We recommend letting your local restaurant know that you'd love to see them back on the menu! Of course, this means some may not be able to find the holiday pie — at least not yet — but those who have tasted the custard-filled pastry have already taken to Twitter to express their excitement. I don't promote the eating of sweets, but every now and then, it's okay. As with all seasonal goods, the holiday pie will only be available for a limited time, so if you find them in your neighborhood, be sure to grab one before they’re gone.